Essence has revamped their Color & Go line of polishes with a new bottle design and some gorgeous colors. The newer bottles have an improved formula, a wider brush and a little more product compared to the older petite bottles and are priced at $1.99. I've previously featured the Color & Go polishes and they are some of my favourite budget friendly nail polishes. The formula of the new polishes are just as nice as the old ones. I had no problems with brush strokes or bubbles. I did need a couple of coats for complete opacity and the new colors out for fall are very unique too. 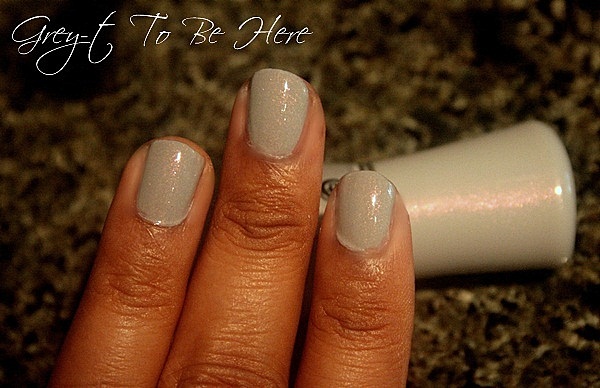 Grey-t To Be Here - A creamy grey with blue and pink shimmer running through. The color is very soft and pale. I like how the shimmer keeps it from looking really flat. 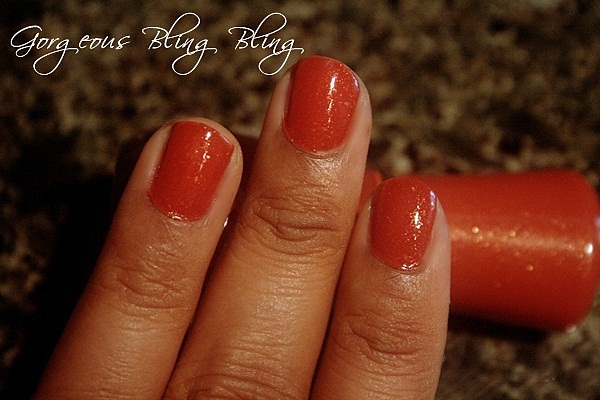 Gorgeous Bling Bling - A burnt orange-y red with gold flecks. The flecks are a good size and show up pretty well in just one coat. This polish looks great on its own with two coats and stunning when layered over another darker base. Overall, I think the newer Essence Color & Go Nail polishes are pretty amazing and have a really nice consistency to work with. These polishes aren't under a dollar anymore but, they also have more product than the older bottles. Since I have very small nail beds, wider brushes don't work well for me but the brush that comes with these Color & Go polishes isn't all that wide. They are quite short too which works perfectly well for my smaller nails. With a good topcoat on, these polishes started chipping after 3 days on me. Have you tried the new Essence Color & Go Nail Polishes?